This Solent sailing school offers a full range of RYA practical sailing courses, including Competent Crew, Day Skipper and Yachtmaster. 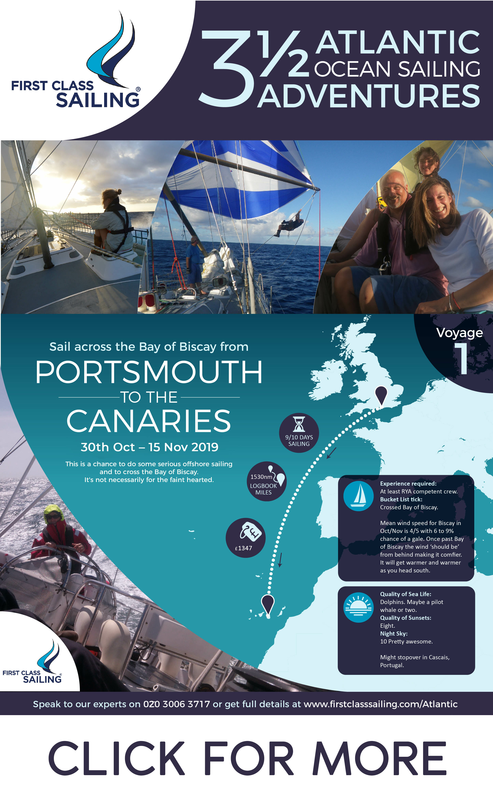 Run by First Class Sailing, you can take any of our practical courses from Shamrock Quay, our base in Southampton, Hampshire on the UK's central South Coast. The Solent is a fantastic place to learn to sail. It's relatively sheltered waters and tides provide an excellent environment for both beginners and advanced sailors. Perfect for beginners and for those that have done a little sailing before. It will transform you into a useful crew member. For aspiring skippers with some yachting experience and basic navigation and sailing skills. Prepare for the RYA/MCA Yachtmaster Coastal Certificate of Competence Exam. Prepare to take the exam for the pinnacle of yachting qualifications the Yachtmaster Offshore Certificate of Competence. The complex tidal systems in the Solent make this stretch one of the best sailing classrooms in the world and learning to sail here will allow you to charter a yacht from any port or marina. These interesting tidal challenges, along with the variety of wind conditions caused by the headlands and local geography, make every day a different experience. On a 5-day course you are likely to see a huge variety of craft afloat, but even amid this hustle and bustle on the water, you still feel like you've got away from it all. We occasionally run RYA shore-based navigation classes and the RYA supplementary courses like VHF Radio and First Aid in Shamrock Quay and within company offices in Southampton and nearby towns and cities such as Bournemouth and Portsmouth. The Port of Southampton was once called the ‘Gateway to the World’ and even today some of the world’s largest ships come to offload or pick up cargo or cruise line passengers. It has an airport and great train and road links for quick access. As a channel of water between the mainland and Isle of Wight the Solent is flanked by a concentration of interesting ports and harbours, creeks and rivers that make the area renown for sailing and shipping. From a practical point of view, Shamrock Quay gives easy access to Southampton Water and the whole Solent, to France and the Channel Islands and down the coast towards Dorset, Devon and Cornwall. To use a VHF it is a legal requirement that someone on board must have a VHF Radio Licence. After taking the VHF Radio Course either in a classroom or online you must attend and pass an assessment in order to get the licence. Understand how to use the safety equipment on board a boat. A genuine lifesaving course. Excellent training for recreational and racing skippers and crews who may encounter rough weather and problems at sea. First Aid knowledge can save lives. Prevent and solve diesel engine failure. Understand radar as an aid to navigation and collision avoidance. What is Great About Learning to Sail in the Solent? The Solent is a fantastic place to learn to sail. It's relatively sheltered waters provide an excellent environment for both beginners and advanced sailors. The Solent waters attract a huge variety of vessels. Over a 5 day course you can expect to see any number of large commercial ships pulling into Southampton or Portsmouth: container ships, cruise ships, car carriers, oil tankers, gas carriers, ferries, war ships, tugs and dredgers. You will also see lots of fishing boats and of course lots of other yachts of all shapes and sizes. It all makes for a very interesting time on the water. On a course you will visit places like Cowes on the Isle of Wight - a sailing mecca for many enthusiasts and a pretty little town with plenty of pubs and restaurants, Lymington at the far end of the New Forest, Yarmouth at the western end of the Isle of Wight, Southampton Town Quay, Beaulieu in the heart of the New Forest, the charming River Hamble, the historic Port of Portsmouth, Newtown Creek that can often look tropical with its surrounding azure waters, Wootton Creek and a few other places. In addition to the other boats you will see and the places you will visit, the Solent offers interesting and excellent tidal experience to anyone learning to sail. Our South Coast office is open 8am to 7pm Monday to Friday. Getting to Southampton is very straight forward. The closest mainline railway station to Shamrock Quay is Southampton Central from which the marina is an 8 minute taxi ride. The closest airport is Southampton Airport which is a 15/20 minute taxi ride away. If you are traveling from abroad (and we do get lots of people coming from abroad - see our diversity of nationalities page) then we recommend you talk to us before booking. There is plenty of parking at Shamrock Quay. It is free and reasonable secure in that there is a 24 If you need directions to our Shamrock Quay location and you are coming London then click here for directions and a map. At First Class Sailing we pride ourselves on the quality of our courses and a personal approach. Every customer is important to us so when you buy from us it seems fair that we should guarantee what we do. With the following guarantees and promises we hope that you will feel you can buy any First Class Sailing offering with the confidence that you are making an excellent decision.